Meigs seniot Devin Humphreys (40) releases a shot attempt over a Jackson defender during the second half of Thursday night’s girls basketball contest in Jackson, Ohio. JACKSON, Ohio — Thorough, from start to finish. 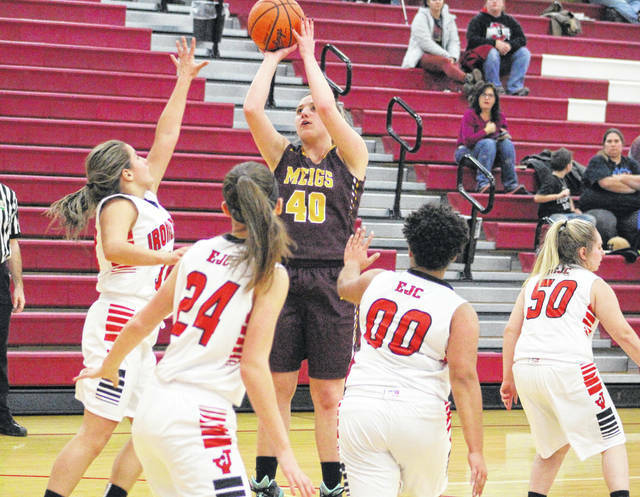 The Meigs girls basketball team shot 40 percent from the field, committed only three turnovers and never trailed on Thursday night during a 48-26 victory over host Jackson in a non-conference contest in the Apple City. The Lady Marauders (7-5) picked up their third straight win as the guests broke away from an early four-all tie with a 14-3 charge over the final four minutes of the opening canto, which led to an 18-7 cushion. From there, the Maroon and Gold methodically extended their lead as the Ironladies (5-7) were never within single digits the rest of the night. Meigs opened the second canto with a 7-2 surge for a 25-8 cushion at the 3:25 mark — its largest lead of the first half — but the Red and White answered with four straight points from Elizabeth Fout to cut the deficit down to 25-12 with 1:37 left until halftime. Kassidy Betzing, however, capped an 11-point first half performance with a basket with 75 seconds remaining, allowing the guests to secure a 27-12 advantage at the break. JHS made a small 3-2 run to close to within 29-15 with 6:31 left in the third period, but the hosts were never closer the rest of the way. Meigs — which went without a turnover in the third quarter — closed the final 6:13 on a 7-2 charge to that resulted in a 40-20 edge headed into the finale. Betzing — who scored four straight points to cap a 6-0 run — gave the guests their largest lead of the night at 46-22 with 4:15 left in regulation. The Ironladies ended the game with a small 4-2 run to complete the 22-point outcome. With Jackson’s top overall player — Rebekah Green — out for the season with a torn ACL, the Ironladies were making their first outing with a new approach. JHS tried to feed the ball inside to Marley Haynes early and often, which did allow the hosts to draw some fouls while keeping things close in the opening three minutes of regulation. Meigs, however, changed tactics by applying more full-court pressure — which yielded plenty of positive results. The Ironladies finished the game with 10 turnovers, with five coming in each half. Afterwards, MHS coach Jarrod Kasun was pleased with the overall performance — especially given the fact that his troops are in the middle of a seven-game road trip that includes three straight triumphs. “Their big girl hurt us there early on, so we went up-tempo with our press and really tried to make their guards work so that it wasn’t so easy for them to get the ball in to Haynes,” Kasun said. “We were able to get some points off of some turnovers, but we were also a little impatient on some shots from the outside. We were able to take the ball to the hoop a little more as the game progressed. The Lady Marauders outrebounded the hosts by a 29-22 overall margin, including a 13-7 edge on the offensive glass. The Maroon and Gold also never committed more than one turnover in any period of play. 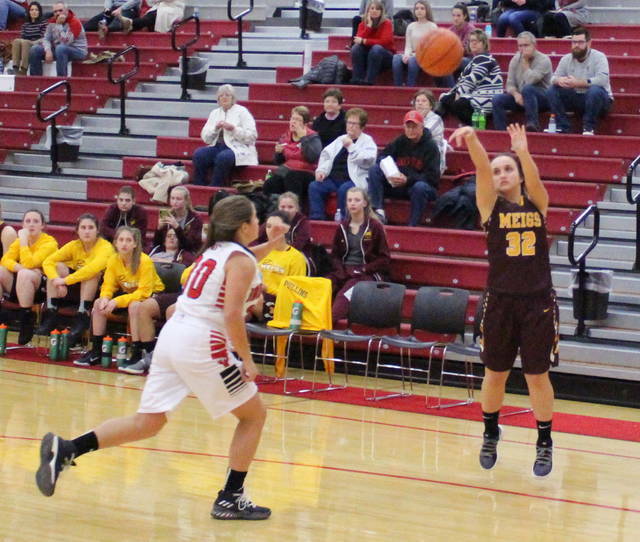 Meigs made 20-of-51 field goal attempts, including a 4-of-15 effort from three-point range for 27 percent. The guests were also 4-of-5 from three free throw line for 80 percent. 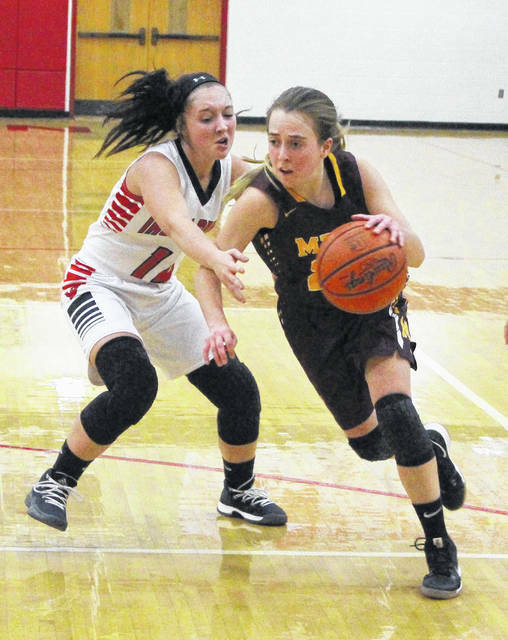 Betzing led MHS with a game-high 21 points, followed by Madison Fields with eight points and Marissa Noble with seven markers. Madison Hendricks was next with six points, while Devin Humphreys and Taylor Swartz respectively completed the winning tally with four and two markers. Fields led Meigs with a game-high nine rebounds, while Betzing and Becca Pullins respectively hauled in six and four boards. Jackson netted 9-of-35 shot attempts for 26 percent, including a 1-of-11 effort from behind the arc for nine percent. The hosts were also 7-of-15 at the free throw line for 47 percent. Fout paced Jackson with nine points, followed by Raylene Hammond with eight points and Haynes with seven markers. Mariah Ridgeway completed the JHS tally with two points. Haynes grabbed eight caroms for the Red and White, while Fout and Hammond respectively added six and three rebounds in the setback. 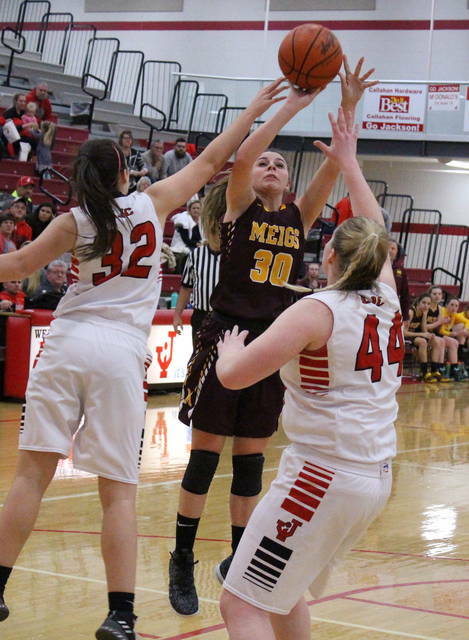 Meigs returns to action on Thursday when it travels to Nelsonville-York for a TVC Ohio contest at 7 p.m.